DANBURY, Conn., Sept. 6, 2018 /PRNewswire/ -- Cartus Corporation, a leading provider of global relocation services, announced today the company's newest technological innovation, the Cartus MovePro ToolKitSM. This dynamic suite of digital tools provides clients and customers with easy-to-use products to navigate the entire relocation process. The first innovative offerings from Cartus' newly formed Product Solutions team, these new technology products include three specifically created for relocating employees and one built for mobility managers. Powered by Cartus' predictive analytics practice, LEAP, the interactive MovePro Timeline updates employees in real time as their move progresses. Cartus' MovePro Dashboard is a business intelligence tool created with the modern mobility manager in mind. Completely customizable, the tool allows users to see the most relevant Key Performance Indicators (KPIs) associated with their employees' relocations. 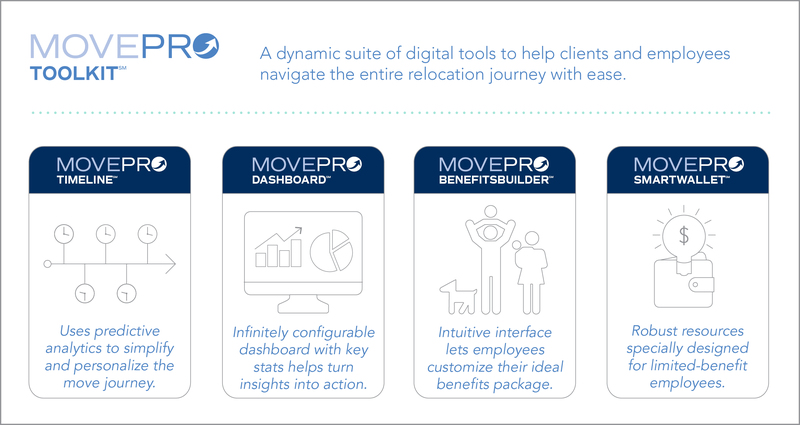 MovePro BenefitsBuilder provides a new way for employees to manage their relocation journey. Mobility managers with points-based policies can enable employees to customize their relocation by choosing the services they want from their bank of relocation benefits. "MovePro ToolkitSM is the first of several offerings launched by the newly created Product Solutions team, reinforcing our tech-forward vision for Cartus. When we launched our predictive analytics practice, LEAP, in Q1 2018, it created the agile foundation for Cartus to build dynamic products like MovePro Toolkit. As we develop innovative tech solutions, we are working directly with our clients to continuously enhance the relocation journey." "Whether relocating across the country or around the world, the moving process can feel overwhelming. Cartus' new MovePro TimelineSM will transform the relocation experience for employees and their families through a real-time, personalized, and predictive view of their move – showing them where they are in the journey and, more importantly, what's around the corner." "The MovePro BenefitBuilderSM is a unique way for clients to manage costs while putting the transferees in control of their relocation experience. Our customers will be the beneficiaries of this pioneering technology in the industry, and they can completely customize their relocation benefits based on the allotted services their company has pre-approved."